The solar system seems to be getting more crowded by the day as its once nine-world population gives way to a realm of planets, dwarfs and the dim and distant plutoids. But in reality, the solar system is still the same. It’s just the names for the new stuff astronomers find that are changing. 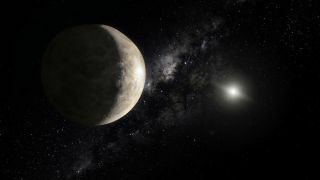 Objects such as Eris and the newly-named Makemake, which like Pluto circle the sun out beyond the orbit of Neptune, also fall among the plutoid and dwarf planet ranks. By the IAU’s 2006 definition, a planet is a celestial body that orbits the sun, has enough mass that its gravity gives it a nearly round shape and has cleared its surrounding area of debris. Pluto, while round and orbiting the sun, is one of a swarm of so-called trans-Neptunian objects, small icy bodies in the comet reservoir of the Kuiper Belt that extends out from Neptune’s orbit, leading to its IAU demotion. But critics have said that asteroids can be found accompanying established planets like Earth, Mars and Jupiter, throwing a wrench in that requirement. A dwarf planet, meanwhile, is defined as an object that orbits the sun, has enough mass and gravity to assume a nearly round shape. It need not have swept its local region clean, which opened the dwarf planet gate not only for Pluto, Eris, Makemake and others beyond Neptune, but also Ceres - the largest asteroid in the solar system. Ceres circles the sun in the asteroid belt between Mars and Jupiter. Objects smaller than a dwarf planet are called solar system bodies, according to the IAU. Other astronomers refer to such things, right down to relatively small asteroids, as minor planets. Last month, the IAU also reclassified Pluto, and any other dwarf planet or round object beyond Neptune, as a so-called plutoid. Like dwarf planets, plutoids must orbit the sun and be massive enough to maintain a nearly round shape. But they also must be located beyond the orbit of Neptune, which circles the sun every 165 years from a distance of about 30 astronomical units (AU). One AU is the distance from the Earth to the sun, or about 93 million miles (150 million km). It should be noted that according to the IAU, the small moons of dwarf planets or plutoids cannot themselves be considered as dwarf planets or plutoids. The three designations have taken center stage in recent years as astronomers spot new objects and refine the orbits and attributes of other known, but distant, solar system bodies. There are other, even odder designations – things like plutons, plutinos, centaurs and EKOs – but when it comes to actually naming something, the IAU wins out. Take Makemake, which earned its name this summer three years after its discovery in 2005 by astronomer Mike Brown of the California Institute of Technology in Pasadena, Calif., whose team has discovered myriad similar, distant objects. When astronomers spot a previously unknown solar system body or dwarf planet contender, it gains a provisional moniker (Makemake was 2005 FY9) and is then observed until its orbit can be better determined. Once that happens, it is given a permanent designation by the IAU’s Minor Planet Center (136472 for Makemake) and awaits the selection of an an official name. The discoverer of an object can then suggest a name to the IAU, which meets in a committee to decide on its suitability. For Makemake, Brown chose the name of a fertility god from Rapa Nui, or Easter Island. Since 2006, there have been just eight major planets, by the IAU’s definition. Starting closest to the Sun, they are: Mercury, Venus, Earth, Mars, Jupiter, Saturn, Uranus and Neptune. With the exception of Earth, the planets were named after major players in Greek or Roman mythology, a tradition that began in antiquity and was continued with the somewhat recent discoveries of Uranus (in 1781) and Neptune (in 1846). The same approach was applied to Pluto when astronomer Clyde Tombaugh spotted it in 1930, though the demoted world’s name was actually suggested by then 11-year-old Venetia Burney Phair of England. She named the world after the Roman god of the underworld. In addition to Pluto, the dwarf planet population of the solar system currently includes Ceres, Eris, Makemake and another world currently dubbed 2003 EL61. Named after a Roman goddess of grain, Ceres was discovered in 1801 and was initially considered a planet until astronomers began to spot other asteroids circling the sun in nearby orbits. While a dwarf planet, the round, potentially water-ice bearing space rock does not qualify as a plutoid because it circles the sun well inside the orbit of Neptune. Unlike Ceres, Eris (ee'-ris) does qualify as both dwarf planet and plutoid. It is about 70 miles (112 km) wider than Pluto, orbits the sun from about 9 billion miles (14 billion km) away and is one of the brightest objects in the Kuiper Belt. Discovered by Brown and his team in 2005, Eris was initially nicknamed “Xena” and its solitary moon “Gabrielle” after the lead characters of a television show. It takes its official name, Eris, from the Greek goddess of chaos and strife as a fitting tribute to the debate it and other object sparked over the definition of a planet. The object’s moon, Dysnomia, is named after the daughter of Eris, who served as the spirit of lawlessness. Makemake (pronounced MAH-keh MAH-keh) is the newest dwarf planet and plutoid to gain a name. The tiny red-hued world is though to be covered with a layer of frozen methane and is smaller and dimmer than Pluto. Earlier this month, the IAU officially announced that the object was named Makemake after the Polynesian god of fertility and creator of humanity among the people of Rapa Nui, also known as Easter Island, in the Pacific Ocean. Brown learned of the name while researching various mythologies for potential monikers and found it particularly striking. “Eris, Makemake, and 2003 EL61 were all discovered as my wife was 3-6 months pregnant with our daughter,” he said in a statement. While it doesn’t have an official name yet, 2003 EL61 is an object also discovered by Brown’s team and an independent group led by Jose-Luis Ortiz of the Sierra Nevada Observatory in Spain. It has its own moon, is about 32 percent as massive as Pluto and about 70 percent that of Pluto’s 1,413-mile (2,274-km) diameter. But it’s also shaped like an ice-covered football, making it one weird, distant space cookie. Then there’s Sedna (sed’nah), an object about three-fourths the size of Pluto that is so far out from the sun it takes about 10,500 years to make a single orbit. Sedna is about 1,100 miles (1,770 km) wide and circles the sun on an extremely eccentric orbit that ranges between 8 billion miles (12.9 billion km) and 84 billion miles (135 billion km). Brown’s team led the discovery of that object in 2004 and named it after the Inuit goddess of the sea. Sedna does not qualify as a plutoid because of what some astronomers see as a quirky threshold for how much sunlight it reflects: Sedna is too dim. Quaoar (KWAH-o-ar), another find by Brown and co-discoverer Chad Trujillo, is 780 miles (1,250 km) wide, half the size of Pluto and takes 288 years to orbit the sun from about 4 billion miles (6.5 billion km) away. It was named after the creation force of the Tongva tribe of the Los Angeles basin. Brown’s team also found Orcus (awr-kuhs), or 2004 DW, an object about 994 miles (1,600 km). It is nearly 47 AU from the Sun, was discovered in 2004, and is so Pluto-like in its attributes that astronomers named it after the Etruscan counterpart of the Roman underworld deity. And there’s still Varuna, or KBO 20000 Varuna, an icy object 40 percent as large as Pluto and 560 miles (900 km) wide that was first spotted in 2000 by astronomers using the Spacewatch telescope in Arizona. But don’t get too comfortable with this list. There’s surely more to follow. By the IAU’s own admission, at least a few dozen more dwarf planets, if not hundreds, remain to be found as they silently orbit the sun at the edge of the solar system.